LG’s unveiled its new lineup of OLED displays at in Las Vegas and made even the most jaded take notice. 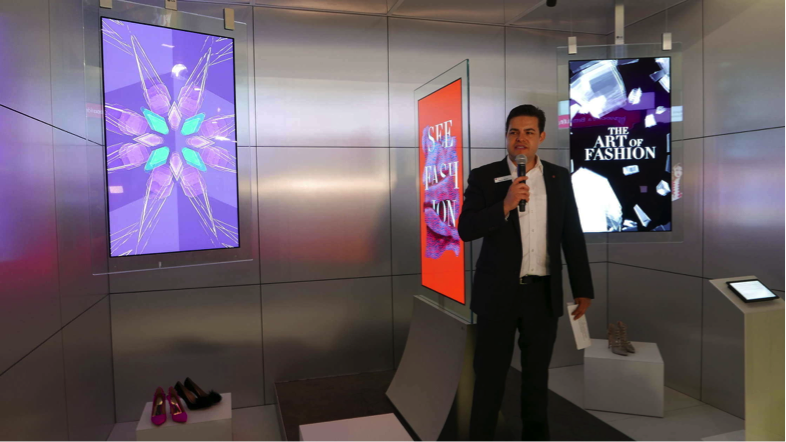 On the morning of the first day of the Digital Signage Expo, Garry Wicka of LG gave the gathered press a guided tour of the new offerings. And those offerings raised LG’s own high bar set by their 2016 DSE and InfoComm show wares–and even raised the OLED bar LG set at ISE 2017 in Amsterdam just two months ago. Figure 1 Garry Wicka of LG Demos Super-thin LG OLED Wallpaper Commercial Display. Front and center at the LG booth were OLEDs, in several varieties: new, very thin, lightweight LG OLED “Wallpaper” commercial displays; and new flexible, customizable open-frame. And with all the new OLED configurations message about OLED’s was impressive imaging qualities including the super high contrast, the deep black levels, and the lack of any discernable image compromise at extreme off-axis viewing angles. The launch of the LG OLED Wallpaper commercial display – shipping in the United States next month according to LG. The 55-inch display weighs less than 13 pounds and has a depth that is just 3.65mm. It really hugs the wall, floats on the wall, and does not jut out from a wall like most digital displays. From a distance it’s as if the display is painted on the wall, it’s that thin. It can be mounted either vertically or horizontally. The electronic components are housed in a separate control box connected to the display with a 2-meter (6-1/2-foot) cable. The LG OLED Wallpaper commercial display features full HD picture (1920 x 1080), 64GB of internal memory, content scheduling and Wi-Fi connectivity with the use of a Wi-Fi USB dongle for ease of installation and end-user operation. And shown in the U.S. for the first time at the Digital Signage Expo this week is the “In-Glass Wallpaper” version of the LG OLED. Designed with dual-sided ultra-slim OLED panels in a glass pane, the In-Glass Wallpaper LG OLED will be available in standing and hanging versions to provide businesses flexible options. In one of the most unusual demos of a digital display technology at any trade show, LG was actually bending the 2x2 OLED displays. The “Open Frame displays are able to flex concave and convex for a truly customizable approach that is both a work of art and a functional signage display,” and the demo proved it. The Dual-View Curved Tiling LG OLED displays offered a curved design using slim tiles to form customizable displays that link combinations of two to eight tiles together. The 65-inch portrait display has a depth under 9 mm (about one-third of an inch), and a unique dual-sided view to offer users two-sided media. Each screen is 4K Ultra HD resolution (3840 x 2160). If desired, the system-on-a-chip (SoC) and a 128GB internal memory capacity enable UHD-synced playback without the need for PCs or media players.